"It’s taken me some years to realize it, but Jesus didn’t just happen to be in Jerusalem on that first Palm Sunday. He wasn’t on vacation. He wasn’t just hanging out in town. Jesus was in Jerusalem on purpose. He arrived in Jerusalem about the time of the Passover when pilgrims were in the city. When people’s hopes and expectations for the dawn of freedom that Moses had promised in the first Passover might suddenly be realized for them in their time. "Jesus arranged his entrance into Jerusalem to send a message. He entered the city, having come in on one side of the city, the scholars tell us, at just about the same time that Pontius Pilate made his entrance on the exact opposite side of the city. Pilate, coming forth on a warhorse. Pilate, with soldiers around him. Pilate, with the insignias of Rome’s Empire. Pilate, representing the Caesars who claimed to be son of god. Pilate, who had conquered through Rome the people of Jerusalem. Pilate, representing the Empire that had taken away their freedom. Pilate, who represented the Empire that would maintain the colonial status of the Jewish people by brute force and violence. "Jesus entered the city at the same time as Pilate to show them, and to show us, that God has another way. That violence is not the way. That hatred is not the way. That brute force and brutality are not the way. "Jesus came to show us there is another way. The way of unselfish, sacrificial love. That’s why he entered Jerusalem. That’s why he went to the cross. It was the power of that love poured out from the throne of God, that even after the horror of the crucifixion would raise him from death to life. "God came among us in the person of Jesus to start a movement. A movement to change the face of the earth. A movement to change us who dwell upon the earth. A movement to change the creation from the nightmare that is often made of it into the dream that God intends for it. "He didn’t just happen to be in Jerusalem on that Palm Sunday. He went to Jerusalem for a reason. To send a message. That not even the titanic powers of death can stop the love of God. On that Easter morning, he rose from the dead, and proclaimed love wins. "So you have a blessed Easter. Go forth to be people of the Resurrection. Follow in the way of Jesus. Don’t be ashamed to love. Don’t be ashamed to follow Jesus. "Have a blessed Easter. And bless the world. Amen." 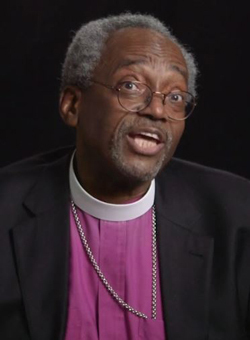 Bishop Curry’s Easter Message 2017 provides a stirring message to set the scene at Palm Sunday. The arrival in Jerusalem is the culmination of Gospel readings since Epiphany. In Luke 9:51 Jesus "sets his face to go to Jerusalem" and concludes nearly ten chapters later (19:27) with Jesus’ arrival in Jerusalem. Curry – "He didn’t just happen to be in Jerusalem on that Palm Sunday. He went to Jerusalem for a reason. To send a message. That not even the titanic powers of death can stop the love of God. On that Easter morning, he rose from the dead, and proclaimed love wins." The scholars he mentions are probably Marcus Borg and John Dominic Crossan whose book "The Last Week" is a day-by-day accounting of Holy Week. We will feature selections from the book next week. In their book, Palm Sunday was the collision of 2 kingdoms – one based in Rome and one based with Jesus with differing value systems.